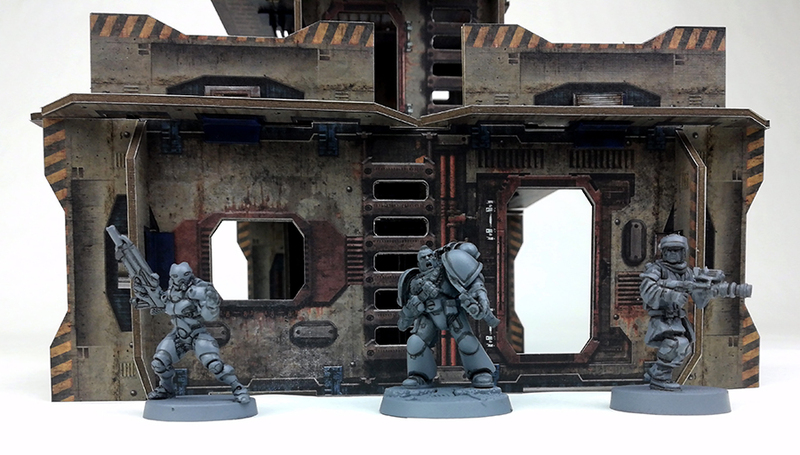 Last post I detailed just how modular our wargaming terrain, Metro Morph, actually is. Today’s post is looking at the overall scale used by the Metro Morph system and how that will suit your miniature wargame of choice. 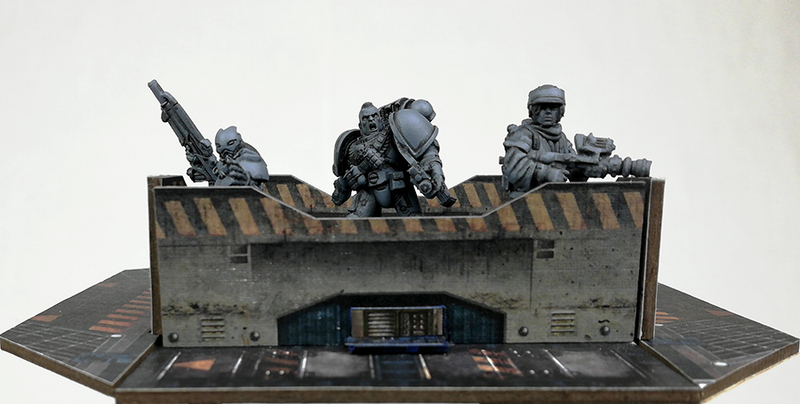 Metro Morph has been primarily designed for play with 28-32mm miniatures. As such, the walls, floors and structures are made to a level which allow for a sense of realistic size at that scale. Now already this may cause some uncertainty, as within the miniature industry 28mm and 32mm scales can vary significantly. 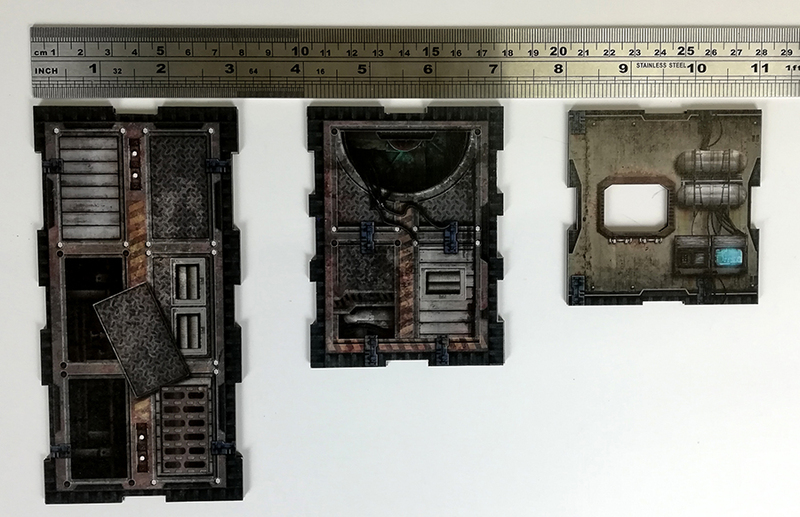 Rather than talking about it, the following pictures should give a good impression of the overall size of the pieces in comparison to some of the more popular miniature lines currently out there. As mentioned previously, the Metro Morph system uses a series of set sized panels to build its terrain structures. To be of further practical assistance within gaming systems themselves, each of these card elements have been designed along an imperial scale. That is they use standard inches as their base measurements, so it makes it extremely easy to calculate heights and distances at a glance. With that all in perspective, it should be a little clearer the actual size of the components of the Metro Morph system. While this scale is what I’ve initially developed, one of the beauties of the system is there is no reason why it could not be extended to various other sizes if the demand is there. So what games do you see yourself playing with Metro Morph? Posted in Metro Morph and tagged building, card terrain, cardboard, miniature, modular, scale. Thanks for the prompt reply! I think that you would definitely appease a majority of Warhammer 40K ITC play style. Organizers like myself would easily spend their hard earned dollar on your company for the sake of simplicity. Organizers spend a lot of time pitching to store owners how they could spend 1000’s of dollars to invest into Warhammer 40K and/or Kill Team,etc and usually Organizers are looked in a negative light which lead to me actually creating portfolios to eliminate the negative connotation. Having a portfolio with your product in it with ITC formatted terrain styles would make my life easier (ie; I won’t have to paint terrain for hours) and stores would be more incline to purchase modular, LOS blocking, and beautifully colored punch board. I love your terrain over all other punch boards but I always run into the same issues all the time with aesthetics and well, lack of LOS blocking terrain. I appreciate the options and they are not going unheard but I feel that the store owners and I would have to purchase an assortment of sets which is superfluous for our cause and without seeing it in person I wouldn’t be able to tell what is most efficient. Believe you me, I understand that you’re business and money is the drive behind production but I would like to see maybe a catalogue specifically for ITC or maybe, packages of this set sold for ITC formats. Just my 2 cents. Essentially, we’re volunteer salesman to terrain companies like yourself! Thanks again and best wishes on the innovation!!!! I am curious to what extent is this terrain actually full LOS blocking terrain? I believe I have seen all of your videos and pictures but the bottom floors have to many gaps, windows and doors open everywhere. When I think of full LOS blocking terrain I think it is optional to remove doors and windows with no gaps. I am a Community Organizer for 40K and I love the aesthetics of your terrain but I have not seen actual LOS blocking terrain for use in 40K. Thank you very much and may you have a wonderful holidays! Thanks for the feedback and question. You are right, the majority of the designated wall sections do have some kind of opening to them. Is something that depending on the interest we could produce by just showing the graphic of an opening but leaving the portal uncut. This is actually a lot simpler to produce production wise. If you need a solution to have totally enclosed, absolute LOS terrain pieces I can think of three options. 3. Leave the portal sections on the card when removing from the punchboard. A little tricky and you would ultimately want to lock those pieces into place with glue to keep them in place gut definately doable. Thanks again for the comment, has given me some potential ideas on how to move forward with some options if there are others like yourself requiring complete LOS blocking structures.